You never get a second chance at a first impression, so when visitors come to call, your front door can say much more about you and your home than you’ve ever realized. If you’re just trying to be welcoming or are looking to sell your home that first impression can make all the difference. 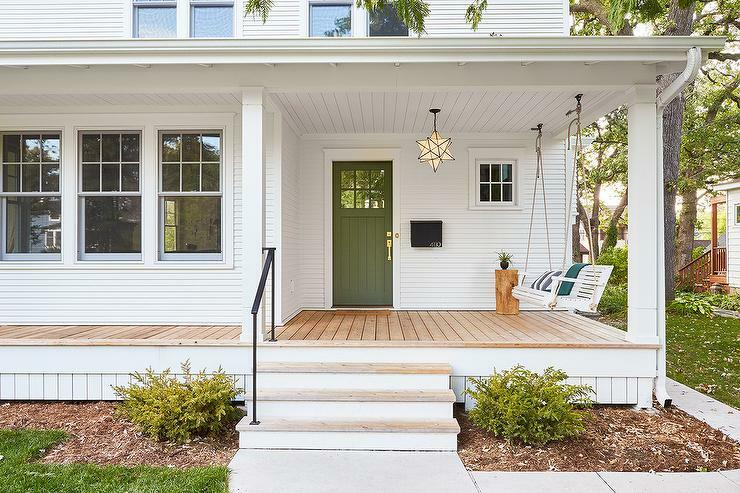 Real estate agents insist the good curb appeal, is often the main factor between a sale, or your place sitting on the market for months and months. 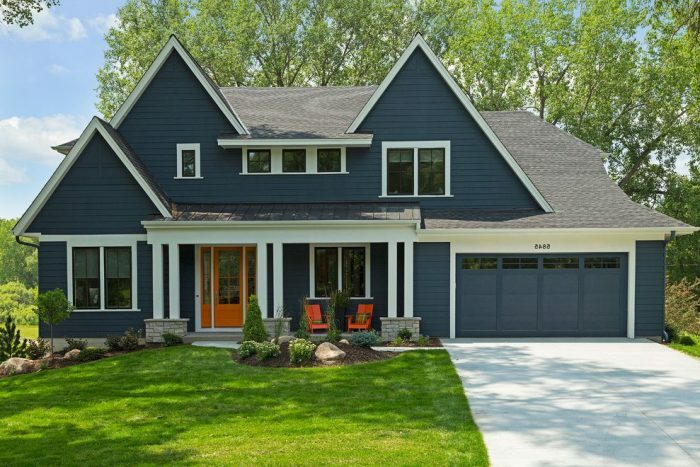 The color of your front door can give the impression your home is comfortable and welcoming, or it might give of a scary vibe that potential buyers run away from. It’s best to start by taking a walk around your neighborhood and look at how other people have painted their front door. Examine the colors they have used, and see if they stand out from the rest of the home, or are muted and disappear into the façade. Look at the impact they have on the home, and the surroundings, and ask yourself if it is in keeping with the style of the building and those around it. After your walk, make the same critical judgment on your own front door and consider what colors might brighten the aspect of our home, and how it will fit in with your next door neighbors. The art of choosing a color is not as simple as picking something you like and looking at a lighter or darker tone. There is a science and logic behind color selection. To help make the right decision, it’s good idea to pick up a color wheel. What’s a color wheel I hear you ask? Well, it’s a tool used by interior designers and artists to select color combinations. A color wheel has the primary and the intermediate colors displayed in an easy to understand circle. The color wheel helps decide on color schemes. There are four possibilities. Monochromatic. A color scheme is described as monochromatic if the chosen colors are all shades of the same color. Analogous. These are colors which are seen next to each other on the color wheel. Contrast. These are three chosen colors that are evenly apart on the color wheel. Complementary. As you might expect, these colors are opposite each other on the color wheel. Following these simple ‘rules’ you can easily pick colors that will be harmonious and have a pleasant appeal. However, they may not go with the canvas you’re applying them to, in other words, your home’s front door. The style of a particular house lends itself to particular colors. A Tudor-style home does not lend itself to pastel colors, whereas these shades work well in homes in tropical and sub-tropical areas of the country. 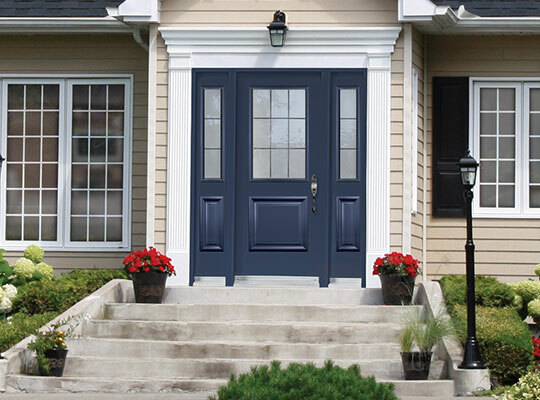 If your home is Colonial-style, then it can often be enhanced with a primary color, and a Mediterranian-style house can look lovely with a Hellenic or turquoise blue front door. Remember, your home is not an island, it also sits in a garden or yard, and has planting and landscaping around it, and this will also have an impact on your color choice. 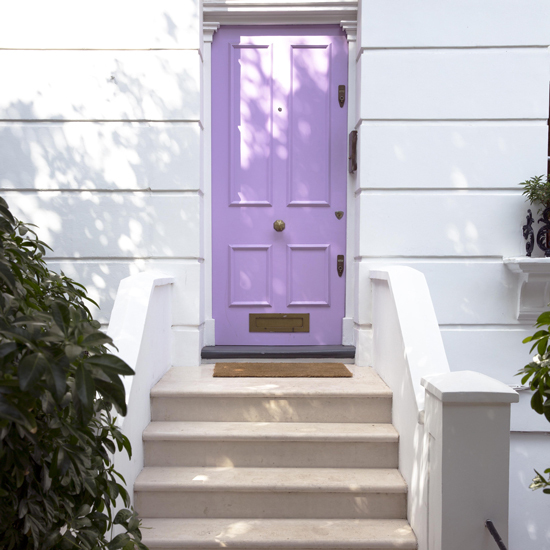 Your front door can stick out like a beacon, as a signpost to where you live, or it can be a muted and blend in with the landscape and the home giving a harmonious look. Whichever way you want the color you choose will give expression to your home. The brighter the color, the more energy will be given off, and a more subdued tone will give the impression of tradition. Darker hues give the idea of staid sobriety, whereas lighter pastel colors tend to be more youthful and playful. The tradition is that a red door signifies a home that his hospitable, and welcoming. The person who lives inside this house likes entertaining and is not afraid of attention. Inside the home may keep to those traditional lines, and may have a nostalgic feel. In Scotland, it’s said, a red painted front door means the owner has paid off the mortgage on the house. Choosing this vibrant color for the entrance to your home can suggest you are something of a social butterfly, who enjoys a good challenge in their life, and likes to challenge others. Interior designers have taken to using orange to replace red on a door as it is seen as more modern and less traditional; more in keeping with a younger household. 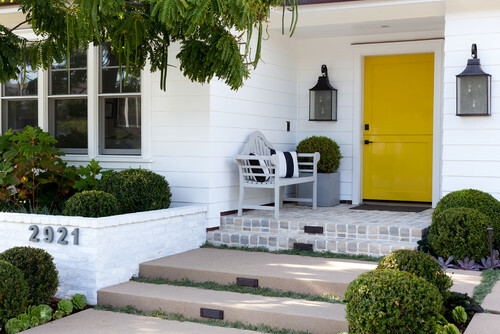 What better way to bring a little sunshine into your life than by painting your front door yellow. A contrasting yellow door will instantly improve the curb appeal of your home. It gives the impression that you as a home owner have a positive attitude to life, and with that brightness, you must be a morning person. Green is another of those traditional colors, which give the impression of seasoned respectability. However, it does show an ambitious streak within the homeowner looking for personal betterment. Green is one of the colors we associate with money, and so behind that green door, you’d expect the family to be careful with their finances. The traditional streak could go as far as asking visitors to take their shoes off when entering the home and having set meal times where the family eats together. The color of the sea and the sky on a front door suggests an owner who is grounded and has a personality that likes peace and tranquillity. Those slightly older householders who are orientated to the family are more likely to have a traditional dark blue door, with a house full of heirlooms. Younger people go with a lighter blue, showing off their calmness and relaxed nature, which is often typified by a beach-bum kind of attitude. Steel blue has a solidity that links with the next color in our list gray. 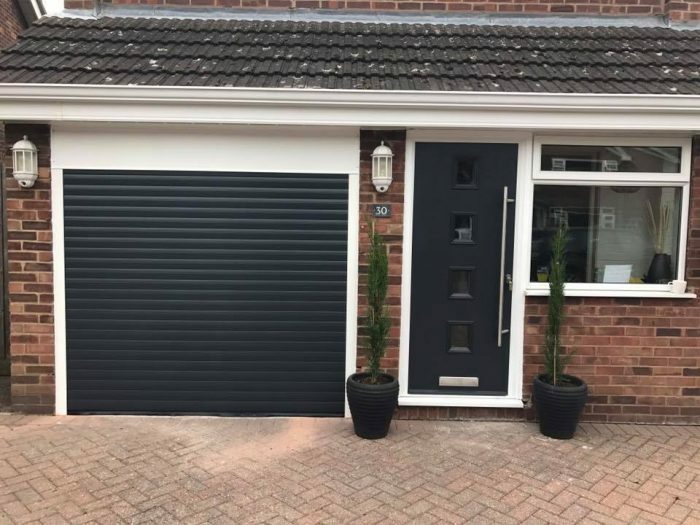 A front door painted gray suggests someone who is willing to negotiate, as the color is somewhere between black and white. However, it does suggest sophistication and an eagerness to keep up with the latest trends. Behind the door, the home is more likely to be minimalist and stylish, where the family enjoys the finer things in life. A black front door speaks loudly about the order and control of the homeowner. It is often found in older style homes, where a door painted black would contrast with the rest of the building focusing the attention on the entrance. Just think of the home of the British Prime Minister in London, where the black door of #10 Downing Street oozes power and authority. Black has a simplicity and elegance that is likely to be mirrored throughout the home. It suggests the owner is cultured and has a grip on life, and can deal with just about anything. 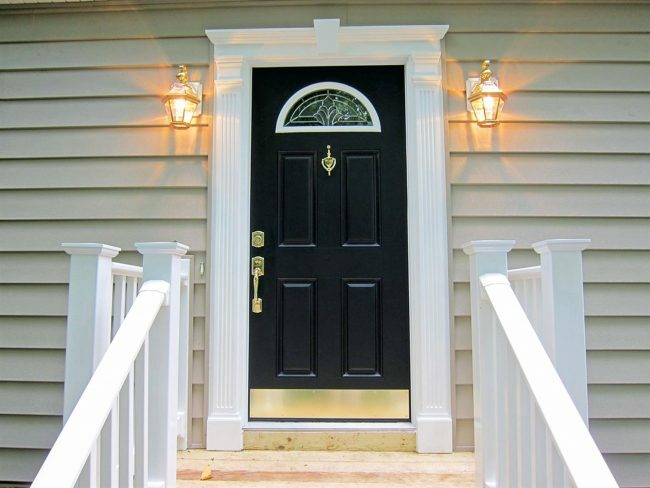 A black front door gives the home owner a wide range of options to accessorize the façade and the home. 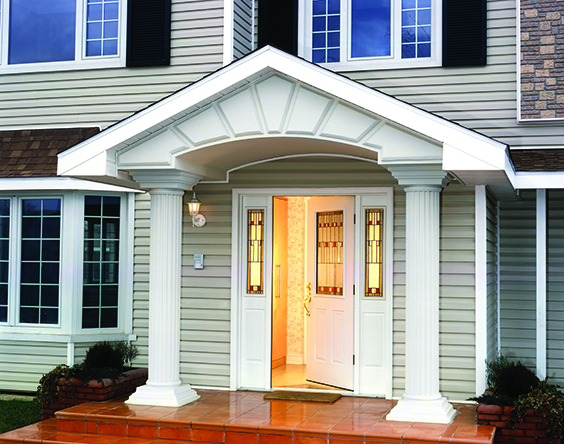 Cleanliness and simplicity are the hallmarks of a home with a white front door. Although it can give the impression of being clinical and maybe a little detached, white suggests an inner calmness. With white you expect the home to be clean and uncluttered, not a spot of dust, and everything in its place. If we were to sum it up in one word, it would be organized. 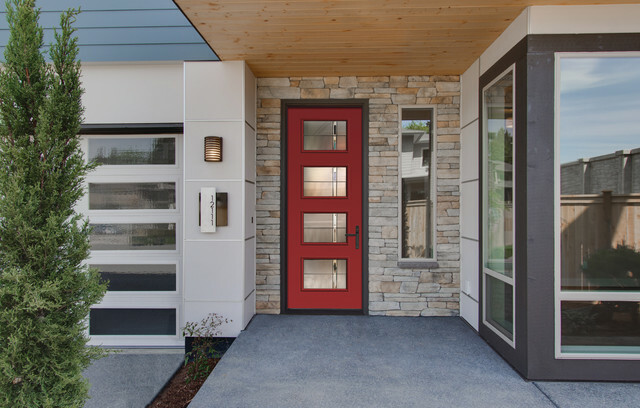 Is not an easy color to choose for a front door, as it has so many connotations. 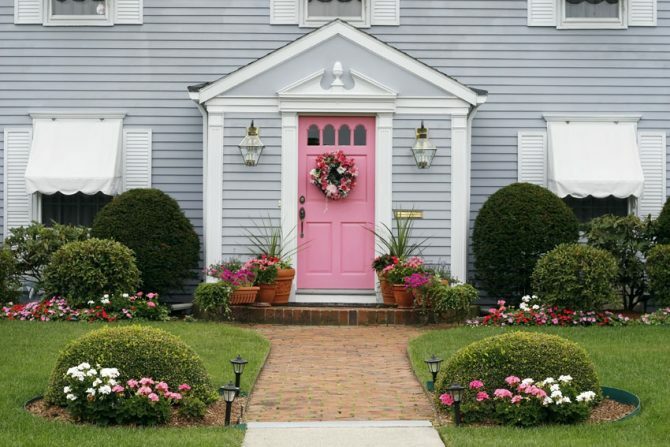 However, in some parts of the world, particularly the Caribbean and tropics, pink along with other pastel colors are some of the favorite colors for a front door, and sometimes buildings themselves. Pink always has a link with people who are romantic, but it also shows the owner can be generous, thoughtful, and cheery and not prone to taking themselves too seriously. Another of those pastel colors so loved in hotter climes. It’s often seen as a compromise color between blue and green and is therefore associated with people who are looking for a balance in their lives. That does not mean they are unthinking, as they are more likely to be dreamers, who are striving to make something of themselves, and a way in the world. You could just call them romantic dreamers. With the announcement of the Pantone Color of the Year two colors linked to the selection are at the top of the trending chart for the front door. Pantone picked Ultra Violet as the color designers would be using as the base for many of their palettes this year, and so light violet has become one of the trendiest colors for 2018. As a pastel shade, it has all the whimsy of pink and turquoise, with an added vibrancy. It shows the home owner is stylish and willing to experiment. 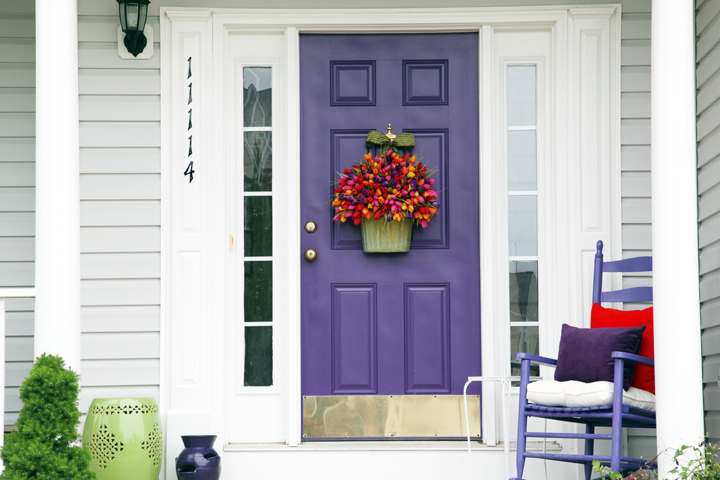 For those people who really want to stand out from the crowd, then the front door color of the year has to be mid-purple. It’s the color of free spirits and risk takers, people who live by their own rules and are not worried about what other people might say. 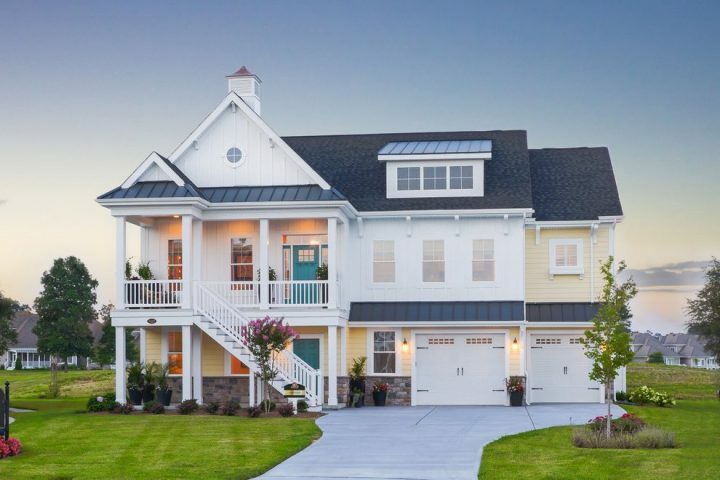 Taking a cue from the Pantone Color of the Year, this shows off the individuality of the home owner, and how they need to break out on their own.